Murder by Gaslight: Murder Among the Whyos, Part 2. Dan Driscoll and Dan Lyons were the successful leaders of New York City’s Whyo gang in the early 1880s. After Driscoll’s arrest for murder in 1886, Dan Lyons became the sole leader, but his reign did not last long. Confusion surrounds the cause of Lyons’ downfall in 1887—most modern accounts say he was executed for murdering a popular amateur athlete, but in fact, he was shot to death by an angry saloonkeeper. Either way, murder led to the demise of the Whyos. The evening of July 5, 1887, Joseph Quinn was sitting on the front steps of his home at 2nd Avenue and 38th Street in New York City, when a man named Dan Lyons walked up and, without provocation, shot Quinn in the head. The men had been fighting over a woman named Kitty McGown, said Quinn’s friends when the police arrived. Lyons had quickly fled the scene. 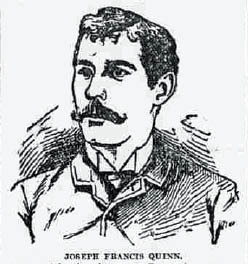 Joseph Quinn was a champion amateur catch-as-catch-can wrestler and a well-known all-around athlete who belonged to the New York Athletic Club and the Pastime Club. His day job was margin clerk of the New York Coffee Exchange. The murder caused quite a stir in the sporting community and on wall street as well. Thousands of people attended his funeral. The city police were under pressure to make an arrest, but Dan Lyons was a burglar, adept at eluding capture. The police first thought he had gone to Long Island, but they soon had reports that Lyons had been seen in several dives in Philadelphia. Detectives Malarkey and Duncan were dispatched to that city, but on arrival, they learned that Lyons had gone to Pittsburg. As the detectives traveled west, so did Lyons and he was next seen in Chicago. Hoping to fool the police, Lyons doubled back to Pittsburg, and there was arrested for burglary. He may have deliberately let himself be caught to hide from his pursuers. When the detectives found him in the Pittsburg jail, Lyons agreed to return with them without formal extradition. When the story broke that Joseph Quinn was killed by Dan Lyons, some speculated that the killer had to be Dan Lyons, the infamous leader of the Whyos, New York’s most dangerous criminal gang. 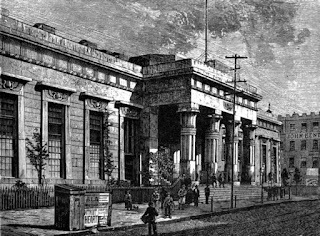 Speculation ceased about a month later when Dan Lyons of the Whyos was murdered in a Five Points saloon while Dan Lyons, killer of Quinn, was safely behind bars in the Tombs prison. The Whyos’ Dan Lyons, who was described as having a lantern jaw and a head shaped like a bullet, had served time in Sing Sing Prison and on August 18, 1887, was out on bail after assaulting a policeman. Early that morning he entered Daniel Murphy’s saloon on Worth Street, in the Five Points, with some friends. Lyons was already drunk and quickly became rowdy. When he threatened to kill everyone there, the bartender threw him out. That afternoon Lyons went back to Murphy’s, still extremely drunk, and demanded to be served. Reportedly, some kittens were running about on Murphy’s floor; Lyons picked them up and bit off the ends of their tails. The bartender, Walter Butler, refused to serve him and told him to leave. Lyons got angry then and began throwing bottles of soda water at Butler. When the owner, Daniel Murphy, came in and saw what was happening he told Lyons to get out. Lyons threw a bottle of mineral water at Murphy, cutting a deep gash under his right eye. Murphy went behind the bar, grabbed his revolver from the shelf and pointed it at Lyons. “Come now, you’ve got to go out.” Murphy said. The trial of Daniel M. Lyons, the burglar, for the murder of Joseph Quinn lasted six days. The highlight of the trial was the testimony of the defendant who explained that Quinn harassed him every time he passed his house. He tried to avoid that corner as much has he could but sometimes he could not. On July 5, he was carrying a revolver hoping to scare Quinn if he saw him. Lyons had believed the pistol was empty and when it went off, he was as surprised as anyone. There was no corroborating testimony to the Lyons’s assertion of self-defense. 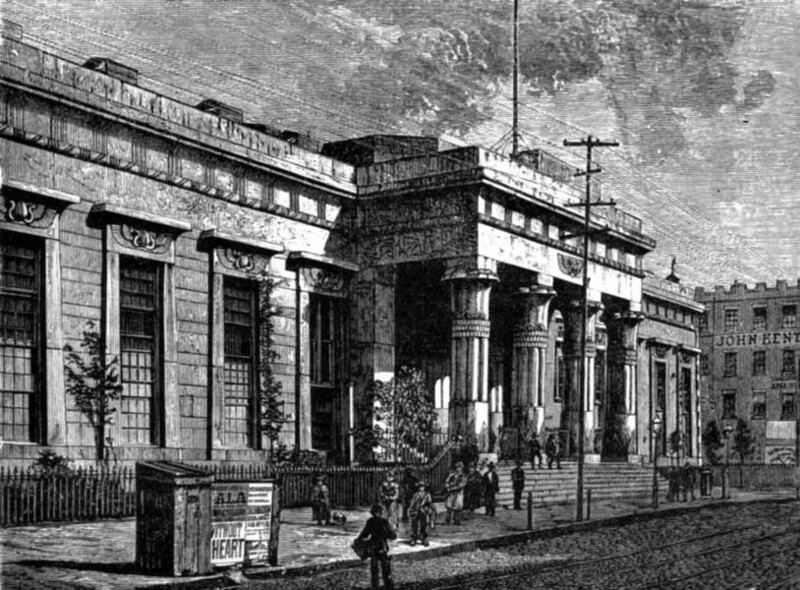 Mrs. Annie Bollinger testified that Lyons had not avoided the corner, she had often seen him loitering there. The jury found Daniel Lyons guilty of first-degree murder. Daniel M. Lyons, the killer of Joseph Quinn, was sentenced to hang, and while awaiting his execution, he was sent to murderer’s row in the Tombs. There he met Dan Driscoll, former leader of the Whyos and ex-partner of Lyons’s namesake. The two became close friends and worked together on several failed escape attempts. Lyons’s attempts to escape the gallows through legal appeals failed as well though they did manage to prolong his life until the following August. 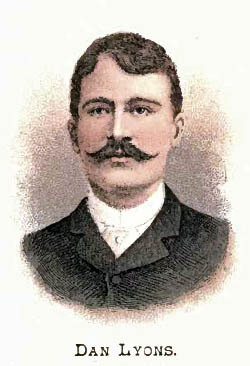 Daniel Lyons was hanged in the courtyard of the Tombs on August 21, 1888. Most modern accounts erroneously state that Dan Lyons of the Whyos was executed for the murder of Joseph Quinn. This error first appeared in Herbert Asbury’s 1927 book, The Gangs of New York. Asbury was a great storyteller and chronicler of nineteenth-century crime, but he was known to the embellish the facts for the sake of the story. In this case, he confused the two Dans, and in his version, Dan Lyons, the Whyo leader, shot Joseph Quinn in a gun battle across Paradise Square, over the affections of Pretty Kitty McGown. Asbury is so well respected that at least three serious authors retold Asbury’s version in their books with very little variation. The Whyos never again had leadership as strong as Dan Driscoll and Dan Lyons. The police came down hard on the Whyos and their numbers dwindled as members were sent to prison. By the end of the nineteenth century, though the Whyo gang still existed, it was no longer a major factor in New York City crime. “An Amateur Athlete Murdered,” Daily Register, July 6, 1887. “Dan Lyons Found Guilty,” Plain Dealer, September 27, 1887. “Dan Lyons Hanged,” Daily Critic, August 21, 1888. “Dan Lyons Homeward Bound.,” New York Herald, July 29, 1887. “Dan Lyons in the Tombs,” New York Sun, July 30, 1887. “'Dan' Lyons Laid Low.,” New York Herald, August 14, 1887. “Dan Lyons Tells his Story,” New York Sun, September 24, 1888. “Dan Lyons Wake,” New York Herald, August 16, 1887. Destefano, Anthony M., Gangland New York (New York: LP, 2015). “Execution of Dan Lyons for the Murder of Joseph Quinn,” Evening News, August 21, 1888. “Lyons in the Tombs.,” New York Herald, July 30, 1887. “Lyons Pleads Self-Defense,” New York Herald, September 21, 1887. “Lyons Tells How He Killed Quinn,” New York Tribune, September 24, 1887. “Lyons to Be Hanged,” New York Herald, September 24, 1887. “Murphy Got First Shot,” New York Sun, August 14, 1887. “Planting a Tough,” New York Herald, August 17, 1887. “Quinn's Murderer in Court,” New York Sun, August 4, 1887. “Shot By a Saloon Keeper,” The Brooklyn Daily Eagle, August 14, 1887. “The Shot Whyo is Dead,” New York Sun, August 15, 1887. “Was it a Conspiracy?.,” New York Herald, July 24, 1887. “Whyos Leaderless Again,” New York Sun, September 22, 1887. “'Whyo' Lyons Dead.,” New York Herald, August 15, 1887.